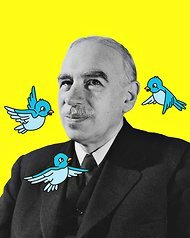 FOR someone who’s been dead for 65 years, John Maynard Keynes has amazing presence. Open a paper, click on a blog or TV, and, voilà, like Waldo, he’s everywhere. The British economic oracle — whose boyhood nickname Snout should tell you that a pretty face isn’t why he’s hot — gets more Google hits than Leonardo DiCaprio. Gov. Rick Perry of Texas apparently got so fed up with the old scene stealer that he interrupted a recent Republican debate to flash his rivals the news that Keynes was, well, deceased. For some, Keynes is the hero who rescued the West from the Great Depression, forothers the villain to blame for the current mess. To me, he’s neither, but rather the Winston Churchill of economics, radiating optimism when things looked bleakest, never so happily engaged as in a national or global emergency. An emergency is what we’re having now, of course. Unemployment has been stuck around 9 percent for more than two years. Business is treading water. Families have less cash to spend. Markets are in turmoil. All our old anxieties have us by the throat again: the American Dream is dead; the middle class is disappearing; our children won’t live as well as we do. Never mind that similar fears proved groundless in the past. When you’re scared in the middle of the night, it’s almost impossible to imagine morning. Keynes’s sunny optimism was most striking in the midst of one of the darkest chapters of modern economic history. If we think of the recession of 2007-9 as a Category 1 hurricane, the Great Depression would qualify as a Category 5. Income, per person, was one-fifth of what it is today, adjusted for inflation. Unemployment was nearly three times as high. More than a third of the population was destitute. There were virtually no government benefits. Boldly, he predicted that by the time his great-nieces and great-nephews were adults, mankind would have solved its “economic problem.” At least in the West, the material requisites for a good life would be available to all. There was, moreover, a solution. Breaking the vicious circle that deflation was creating for farmers and businessmen was well within the power of governments. All the monetary authorities had to do was lower interest rates by creating more money until business could raise prices and would find it worthwhile to begin investing again. What never changed during the Depression and the Second World War was Keynes’s positive mind-set.